From Joan Juliet Buck, former editor-in-chief of Paris Vogue comes her dazzling, compulsively readable memoir: a fabulous account of four decades spent in the creative heart of London, New York, Los Angeles, and Paris, chronicling her quest to discover the difference between glitter and gold, illusion and reality, and what looks like happiness from the thing itself. Born into a world of make-believe as the daughter of a larger-than-life film producer, Joan Juliet Buck’s childhood was a whirlwind of famous faces, ever-changing home addresses, and a fascination with the shiny surfaces of things. When Joan became the first and only American woman ever to fill Paris Vogue's coveted position of Editor in Chief, a “figurehead in the cult of fashion and beauty,” she had the means to recreate for her aging father, now a widower, the life he’d enjoyed during his high-flying years, a splendid illusion of glamorous excess that could not be sustained indefinitely. Joan’s memoir tells the story of a life lived in the best places at the most interesting times: London and New York in the swinging 1960s, Rome and Milan in the dangerous 1970s, Paris in the heady 1980s and 1990s. But when her fantasy life at Vogue came to an end, she had to find out who she was after all those years of make-believe. She chronicles this journey in beautiful and at times heartbreaking prose, taking the reader through the wild parties and the fashion, the celebrities and creative geniuses as well as love, loss, and the loneliness of getting everything you thought you wanted and finding it’s not what you’d imagined. While Joan’s story is unique, her journey toward self-discovery is refreshing and universal. Joan Juliet Buck is an American novelist, critic, essayist, and editor. She served as editor-in-chief of Vogue Paris from 1994 to 2001. While a contributing editor to Vogue, Vanity Fair, Traveler, and The New Yorker, she wrote two novels, The Only Place to Be and Daughter of the Swan. Currently, she writes for W, Harper’s Bazaar, and New York Times T Magazine. “Relentlessly candid and often absorbing account of a complex life spent in and out of the fashion spotlight." "Fans of high fashion and celebrity culture will enjoy this insider account." “Joan Juliet Buck had lived a more brilliant, stranger, more glamorous, sadder, happier, richer, poorer life by the age of twenty-five than most of us do in three times that long and then she went right on living it and then she wrote it down. I'm a sucker for good, smart writing and this book is nothing but good, smart writing and great stories. Terrific stuff." "Anybody could make a riveting life story of the events and rolodex of people in this book, but reading it, I was most reminded of James Salter's autobiography Burning the Days, the inquiry by a great writer into his own remarkable life. It is a moving, Bildungsroman-like account of the inner workings of fame and culture, houses built of cards, aspiration and loss, and a brave search for love. At once an unputdownable romp through sixty years of a world that no one will ever know better than Joan Juliet Buck, and a great literary accomplishment." "The Price of Illusion is a spilled treasure of a book. Unexpected sudden diamonds cascade across every page. The language is dazzling, but even more overwhelming is the Proustian level of observation. Fashion is laid bare of its artifice. Celebrated giants like Peter O'Toole and John Huston show up in human form. And Miss Buck's career and family flameouts dovetail into a single, heartbreaking tragedy. If you are drawn to glamour and pain, get ready to be mesmerized." 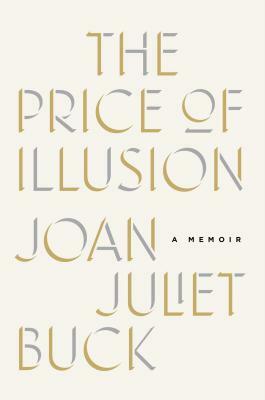 "Like a tin of caviar or a strand of heirloom pearls, Joan Juliet Buck's memoir...satisfies the appetite for luxury [and] poignant instrospection." "A juicy read that leaves no stone unturned in its critical view of the fashion and publishing worlds..."
"One of the most compelling personalities in the world of style...a shrewd and longtime chronicler of trends."